By adding your business card you have an instant imprinted gift item for trade shows and sales meetings, or use for sales calls and prospecting. Peel off the protective liner and press your business card onto the exposed adhesive for an instant imprinted specialty item with the team schedule of your choice on front and Night Game Schedule on back. 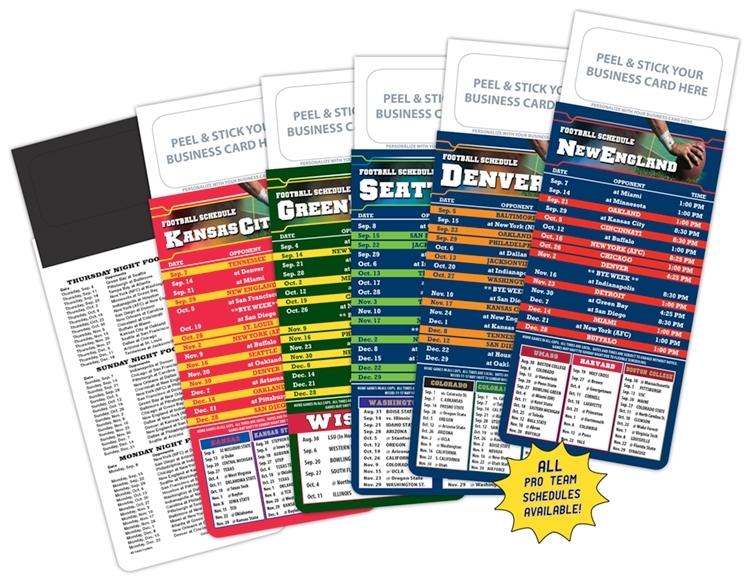 Prices include stock football schedule of your choice. By adding your business card you have an instant imprinted gift item for trade shows and sales meetings, or use for sales calls and prospecting. Simply peel off the protective liner and press your business card onto the exposed adhesive for an instant imprinted specialty item with the team schedule of your choice on front and Night Game Schedule on back. Under Options tab, click on "Click to Choose Football Schedule" to view all teams listed. All Pro Teams available. Schedules available to ship May 5th.